There are 10 players on the floor. Only one player has the ball. That means that 90% of time, you won't have the ball, and that only 10% of the time you may actually have the ball (a little less for post players, a little more for guards). So you have a limited number of opportunities to score from an individual move when you are the ball-handler. Good scorers find ways to get open for an easy pass from a teammate, and an easy shot off the pass reception. Good scorers never just stand around and watch. They are always trying to find ways to get open by coming off screens, or faking and cutting to open areas of the floor (within their shooting range). The keys are timing, cutting to open areas, using and setting good screens, and maintaining good spacing. Keep in mind that it's often the screener who actually gets open after a screen. In regard to cutting, there is a saying "get open, or get out! ", which means that if you are not open, and don't receive the ball within a couple seconds, quickly move out of the paint or baseline area and get back to a perimeter spot to maintain spacing. Passing, dribble-penetration and offense in general is easier if offensive players maintain a spacing of 12 to 15 feet apart. Don't get bunched up, and don't get "stuck" down along the baseline after making a cut inside. Faking is an important skill that is often overlooked and not taught. Good faking is an important key in just about every offensive basketball skill, whether it is an on-ball perimeter or post move, or making a pass, or cutting. A fake simply is a deception or decoy move to throw the defender off balance, or get him leaning the wrong way just long enough so the offensive player can gain a step or two on him, or so a passer can open up the passing lane. Legendary coach Bob Knight has often said that the two most important and most undertaught offensive weapons are the shot-fake and the pass-fake. The shot-fake is a great move when the defender is flying out (closing out) on you on the perimeter. With a good shot-fake, the defender jumps and you dribble around him/her for a one-dribble jump-shot, or a dribble-drive to the hoop. The shot-fake is also an important move for post players inside. Make the shot-fake or "pump-fake" to get the defender in the air, and then you can make a move either into him (and get the foul) or under him ("up and under" move), or maybe a drop-step move either baseline or to the lane, once the defender has left his feet. The pass-fake is also a very important essential fundamental. In high school and youth basketball, I see so many tipped or intercepted passes, not only because the passer does not see the defense, but because he is looking right where he wants to pass ("telegraphing" the pass) and because he does not use a pass fake. Look the defender away. 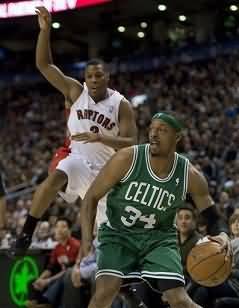 It's been said, "fake a pass to make a pass..." example: fake an overhead pass, and make the quick bounce pass around your defender. Or to pass to the left, give a fake first to the right. The pass fake is also great against zone defenses and should be an important fundamental in your zone offense. The point guard can fake the pass left to get the zone to lean or shift, and quickly pass to the right. A good passer can "look" the defender off his receiver by looking the opposite way that he intends to pass... example: look left, pass right on a fast break. Fakes can be a simple "look away", or can be as subtle as moving your eyes opposite the way you want to pass, or cut. A fake can be a jab step to get the defender leaning, and then you move quickly in the opposite direction. You can fake with a shrug of your shoulders, or a bob of your head in the opposite direction that you plan to cut. You can use a "sleep fake", where you pretend you are winded and tired, and you bend over with your hands on your knees, like you are catching your breath... the defender relaxes too, and suddenly you make your hard, quick cut. 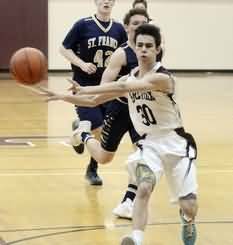 You can use a verbal fake... yell the ball-handler's name loudly and wave your arms to get the defender (who is help-side defense sagging toward the paint) to come out on you. That may open up the lane for a clean cut by a teammate. In this case you don't actually get the ball, but you made the lane available for your teammate to cut through. Have a team agreement... if you yell "ball!" you really want the ball, if you yell a name, it's a decoy. To be a good faker, you need a little acting ability! There are a number of different types of cuts that can be made, in addition to making the correct moves in running a specific play or set motion offense, and in addition to setting and cutting around screens (see Setting Screens). 1. A key in making an effective cut is timing. Try to "time" your cut, so you arrive at the correct time to receive the pass. 2. Make a good fake and cut hard. Often I see kids make a quick fake, and then a somewhat slow cut. Do just the opposite... make a slow, sleepy fake followed by a quick cut move. A quick, strong first step is key. 3. This is another important tip: kids often try to avoid contact with the defender and try to run away from him. In trying to get open, go right up to the defender and make contact with him, then quickly "bounce off" in the direction of your cut. He won't be able to react fast enough to your quick first step. In addition to the cut moves described below, don't forget this move: slip behind the defender (who may be in "deny" and over-playing the passing lane) and move below him toward the baseline. The defender should always see the ball. Try to slip out of his field of vision, so that he loses you briefly... then you can get open. The front cut is a cut made with the defender behind you, on your back. This is the typical "give and go" cut (see Diagram A, FC). Set this up with a shoulder or head fake, or step fake away, and then cut hard around the defender looking for the pass. A back cut is when you cut behind the defender. Use the back-cut when the defender is over-playing you and denying you the pass, the perfect counter for tight defensive pressure. On the perimeter, we use the term "over the read line (3-point line)"... if the defender has a foot above the read line, we want our player to back-cut. Also, if a teammate is dribbling toward you, we like you to back-cut ("dribble-at, back-cut"), unless it is a specified weave, hand-off play. Make a fake up or toward the ball, then cut quickly behind the defender. Back cuts can be a "ball-side" back-cut (see Diagram A, BBC), or a "weak-side" back-cut which means on the side opposite the ball, or "back-door" (see Diagram A, WBC). A cut made in the shape of a "V". Perimeter players commonly use the V-cut to get open for the pass on the perimeter. Versus man-to-man defenses, we don't like passing to players standing still on the perimeter, as these passes are often tipped or intercepted. The first leg of the "V" can be slow. The last leg of the "V" is quick (Diagram B, VC). When making the V-cut, plant the inside foot hard, and step off quickly with your other foot in the direction of your final cut. A cut made in the shape of an "L", often along the lane (or "lane cut"). Diagram B, LC. The cut can be made up the lane, or down the lane (from the wing position). Use footwork similar to the V-cut. A curl is a somewhat circular cut made around a teammate's screen (Diagram B, CC). A screen and curl cut is often a good way to get our better shooters open for a pass and shot. Often our shooting guard will go inside and curl cut around one of our post players to get open. The cutter must learn how to use the screen and read the defender. If the defender chases around the screen, he should curl. If the defender, goes under the screen, he should fade or flare to perimeter for a skip-pass. A quick cut made with a quick stop, a pivot toward the ball, sealing the defender on your back side, and receiving the pass from your teammate (Diagram B, BH). An example would be a post player, or a strong tall guard who has a size advantage over his defender, cutting inside, but instead of cutting back out to the perimeter, he/she quickly pivots and "shapes up" to the ball for a post up for the pass inside. A banana cut is slower, curved or arched cut... not a straight line cut. It is used sometimes against zone defenses when offensive players try to cut into, or fill, the inside gaps in the zone. A "shallow cut" is a type of banana cut. 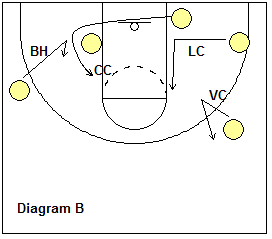 It is a perimeter cut used to exchange positions with another perimeter player who dribbles into your position, while you "shallow cut" to his/her vacated position (Diagram C, SC). We have also had our wing players shallow cut simultaneously to the opposite wing, essentially a crossing action where they switch wings, just giving the defense something new to look at, and sometimes a different way of starting our offense. 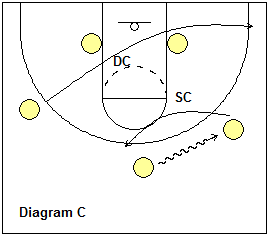 A cut from the perimeter all the way to the basket and out to the side (Diagram C, DC). This is mainly a matter of terminology as back-cuts and front-cuts are both deep "basket" cuts. A fade or flare cut is one that is away from the ball. Usually the cut is made over a "flare-screen". Diagram 8 below shows O4 making the flare-screen for O1. O1 "flares" or "fades" to the corner area for the skip-pass from O3 and the open outside shot. 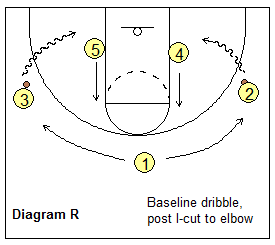 An I-cut is a low post player reaction (cut) to a guard making a baseline dribble (diagram R below). The post player "I-cuts" up to the elbow. This allows for spacing for the dribbler, and also often gets the post player open for a pass from the dribbler. It is a hallmark of the "Read and React" offense, as well as other motion offenses. 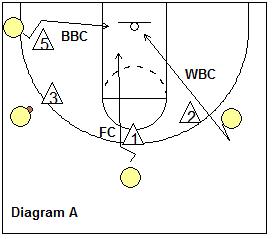 A quick cut made often made by a post player up to the high post (free-throw line) toward the ball (Diagram D1, FC). First walk your defender down to the block area. Then plant the inside foot and quickly make the V-cut back out to receive the ball (Diagram D, JDVC). 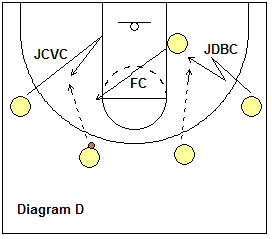 (Diagram D, JDBC) First walk your defender down to the block area. Then plant the inside foot and quickly make the V-cut back out. But this time the defender is ready and is in front you, over-playing the pass. So now plant the outside foot, and go back-door with a quick back-cut. So that the ball-handler knows which way you are going, use a hand signal. For example, if you are going back-door, hold your inside (receiving) hand up high. You will also hear of other cuts that have their origin with specific offenses... e.g. the "flex cut", the "UCLA cut", and the "shuffle-cut". Expanded from its original context within the flex offense, the flex-cut to most coaches now means a cut that occurs whenever a low post player moves part way out to the wing or corner to screen for the perimeter player, who then "flex-cuts" either over or under the screen (diagram A below). 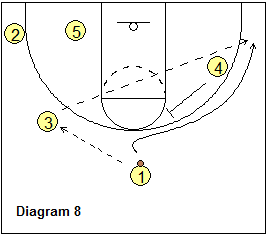 Similarly, the UCLA-cut (which originated with John Wooden's UCLA offense) to most coaches means any high-post (elbow or free-throw line area) screen that a perimeter player "UCLA-cuts" off, looking for the pass inside (diagram 3 below). 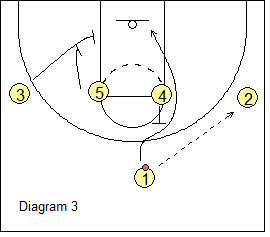 The shuffle-cut originated with Dean Smith's shuffle offense, and now means any post to perimeter off-ball, wing back-screen (diagram A "Basic Cut" below, O5 screening for O1)). with Melanie Balcomb, Vanderbilt University Womens Head Coach. with Steve Alford, Head Coach UCLA, former Head Coach University of New Mexico; former University of Iowa Head Coach.